The UFC was pleased with a gate of $697,901, and the fans were ecstatic by the first UFC event ever held in the state of New Mexico. The 8,775 Albuquerque mixed martial arts fans went home happy as the two native New Mexicans would come out of their fights the victors. The same could not be said for the two transplant, Albuquerque trained fighters. champion Benson Henderson (21-3) was able to weather the Russian’s early storm. 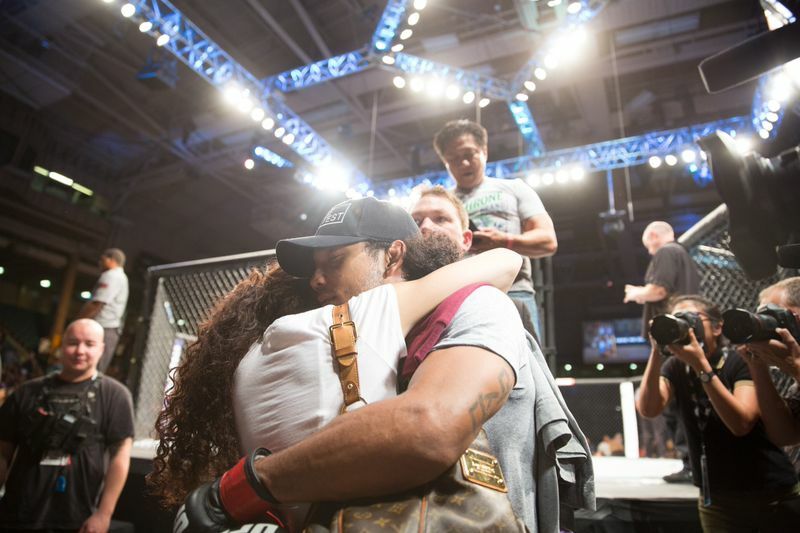 Benson Henderson celebrates his TKO finish vs Rustam Khabilov. Technical kicks to the stomach and ribs from Henderson would slow the Albuquerque-trained Khabilov down, taking away the strength he would need to force takedowns that easily came in the first and third rounds. Khabilov would test new waters entering the fourth round for the first time in his MMA career. A beautiful lead right uppercut and straight left combination would drop Khabilov in the fourth. Henderson would then immediately follow up by securing a rear naked choke which the Russian would tap out to at the 01:16 mark of the round. The co-main event saw the return of the man that put New Mexico MMA on the map, TUF 1 Middleweight Winner, Diego Sanchez (25-7). Sanchez who returned back to his nickname “The Nightmare” had one in the cage, seen in form of an extremely technical Ross Pearson (15-7). Not being baited by Sanchez’s taunts to exchange, Pearson appeared to control much of the contest with slick kickboxing combinations and straight-armed defense that kept Sanchez at bay. Pearson was the quicker of the two fighters either landing lead jabs or kicks. Sanchez had some success responding with sporadic shots during some of Pearson’s combinations. In the third round, a more desperate Sanchez would shadow Pearson’s striking. The timed responses of Sanchez would lead to entertaining exchanges which included a back and forth trading of powershots in the final 10 seconds, vintage Sanchez fights. When the bout was all over it was a forgone conclusion by those at cageside that Pearson would walk away with a unanimous decision. The judges scores were then read: 30-27, 27-30, 29-28. A surprising split decision to the dismay of Pearson and elation of Sanchez would. The result immediately sent the Tingley Coliseum crowd into a frenzy. Upset with the decision, Pearson also spoke to the media about his controversial loss. Pearson also spoke about having a rematch with Sanchez in his home country of England or at a neutral site. Sanchez would also voice his interest on facing Nate Diaz at UFC 180 in Mexico City. The other Albuquerque son, John Dodson (16-6) would be greeted by cheers that Senior UFC members would admit even gave them chills, in the antepenultimate bout of the main card. This would be the second time he and John Moraga (14-3) would face off. A rematch of a 2010 bout that Dodson would win by decision. Not echoing the crowd’s energy, Dodson would remain poised in the first round keeping it basic from a distance. Pulling a page out of legendary boxer Willie Pep’s book, Dodson would control the first round with defense avoiding and blocking the majority of Moraga’s strikes. Once Moraga made the mistake of continuously dropping his right hand, this opened an opportunity for Dodson to land short shots. Others were made easy by Moraga simply walking into them; like a strong leg kick to the ribs at the end of first. The second would see the only real offense from Moraga who opened the round with a flush combination which was immediately countered with a Dodson takedown. Sitting his opponent against the cage the former TUF Season 14 Winner unleashed short effective blows capitalized by a strong right cross. Later in the round Dodson would throw a high left kick as Moraga ducked to dodge it. Dodson knee would land solidly and break Moraga’s nose. His foot on the follow-through also made impact to Moraga’s ribs. Instinctually, Dodson then pounced on his injured bloodied foe launching an onslaught that would fuel the crowds energy. Moraga would make it to his stool but would not come out for the third as the fight would be stopped due to the cageside physician’s advice. This gave Dodson his eighth career (T)KO. “I thought it was going to be a knee (that would catch him) when he was shooting in,” said Dodson of his blow. When asked by a member of the media, Dodson entertained the idea of going up to Bantamweight to face champion T.J. Dillashaw. In total the Albuquerque-trained fighters out of Jackson’s MMA would go 2-2. Earlier in the evening. Erik Perez would lose his contest to Bryan Caraway via rear naked choke. Controversy would also surround this bout in post-fight social media, as several online outlets would show highlights of Caraway using an illegal fish-hook right before locking in the submission. The event’s success came to the delight of UFC Senior Director of Communications Dave Sholler. It is likely that next UFC show in Albuquerque will come in 2015. You can expect for venue to still be at the UFC who admits the structural issues at The Pit do not make it an option and the Star Center in Rio Rancho they feel is not centralized and is also out of the question. Each fighter received an additional $50,000 for their performances. UFC Fight Night Albuquerque Tingley Coliseum Pre-Sale Tickets are Available, Here’s the Code!